Matrix Marquees connect on any of their walls to any other matrix marquee, with gutters fitted and walls velcro sealed they become one seamless event space. Full width panoramic windows combine with skylight roofs to fill the space with light. Views around the venue can be enhanced further by sliding a whole wall open in less than a minute..
Square Matrix Marquee set up as a cool evening drinks venue. As shown with matting and LED Furniture £990. Prices include VAT but may be subject to a delivery charge. Single Hex Marquee built to party with live music, finger food, drinks and dancing. As shown with full matting, LED active lighting, dance floor, stage and tables £1980. 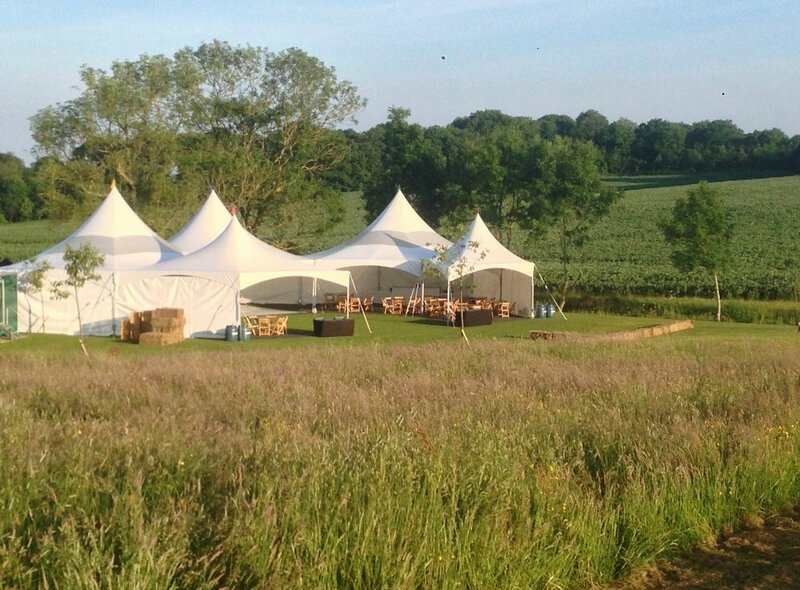 5 marquees linked to compliment venue features and client wishes. Amazing external silhouette and internal space. 2768sq ft floorspace plus 346sq ft catering. As shown with full matting, LED active lighting throughout, dance floor, LED bar set, chill out rattan, tables and wooden chairs £6640. Toilets and Generator optional extras. Curvy open spaces for partying and entertaining. Walls on or off in minutes. The original Party Tent. Designed and made in the USA the Capri Tent creates a pop up venue like no other. With swooping rooflines and arched walls the vibe is relaxed and contemporary. 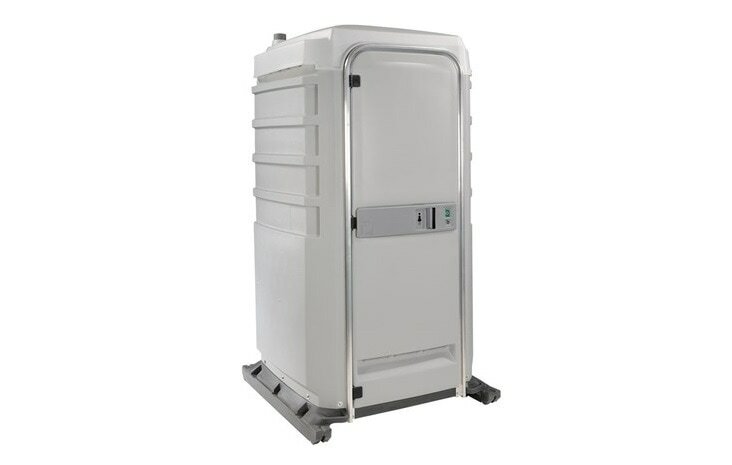 As with any good design it sits comfortably within any environment. As well as shelter from sun, wind or rain. 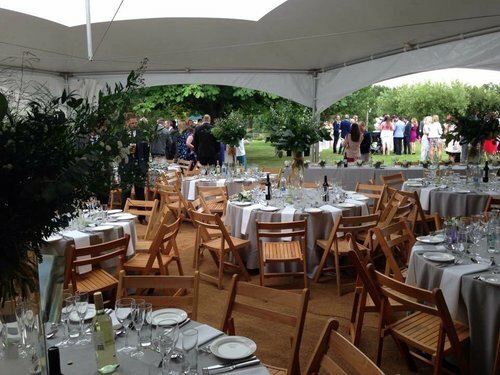 Capri marquees create a great destination space for family, guest or clients. 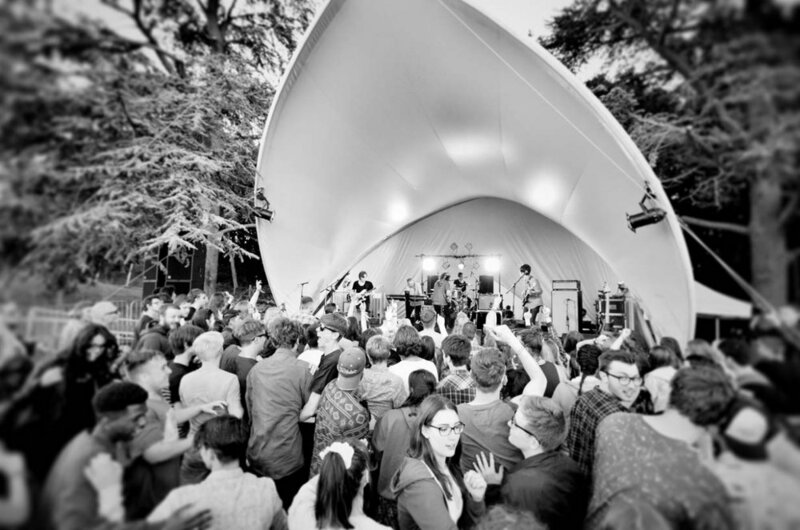 Open air events need shape and zones. Without visual cues people drift and cluster where you least want them.. Easily carried by two people and less than 3ft wide A folded capri and its lightweight aluminium poles can be transported into the tightest of gardens for summer events. As shown with matting, wooden chairs and all tables £960. Pure white roofs reflect the changing colours of our active LED furniture. The whole space glows inside and out. An amazing centrepiece to any evening. As shown with matting and blaze of LED furniture £1806. A 16ft x 16ft dancefloor sits perfectly in the centre of a Capri. 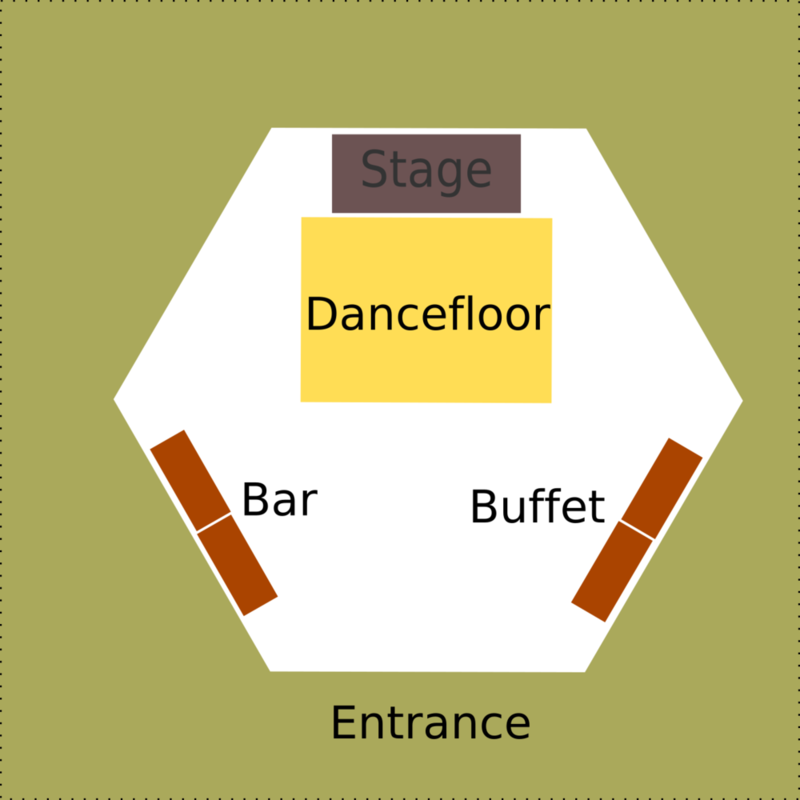 The ideal space for 40 - 80 revellers to stay undercover and enjoy a show or a dance. As shown with matting, dance floor, stage and LED uplighting £1530. Make your space work the way you want: Fill it. Leave it. Zone it. Funk it. Trad it. Dance it. Chill it. 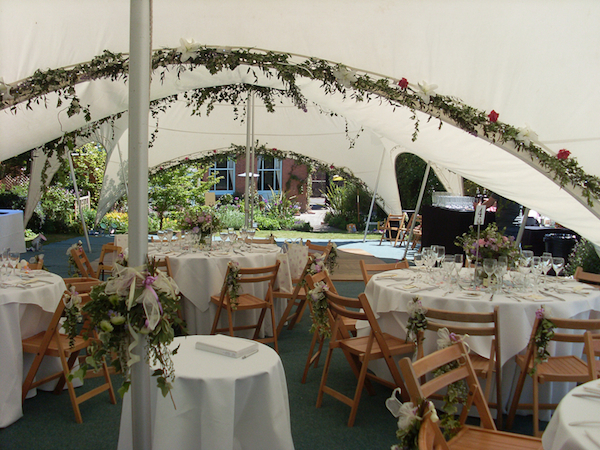 Furnishings set the tone as well as creating form and shape inside a marquee. Comfort, space, cost and style are all key considerations. We've been considering them for more than a decade and if you ask, can help you put together a venue that ticks all of your boxes. 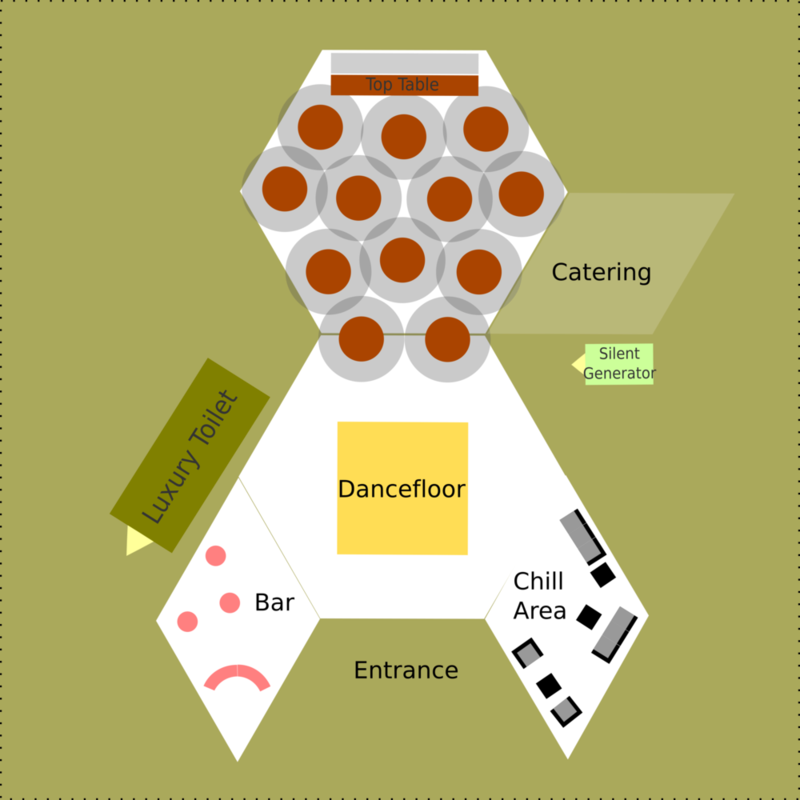 Venue shape and mood can be transformed with table layout and chair choice. Shiny white is our favourite right now. Wherever it goes; marquee, village hall, kitchen, patio. Remote Control Active LED furniture makes a party. Sounds like a great movie title. But its not, its just toilets... and power. Great value and not what you'd expect. LED light, coat hook, mirror. Price includes VAT but may be subject to a delivery charge. Very deceptive units, real wood fittings, music, soap & moisturiser, plenty of paper. We only use powerful event specific generators in sound deadening trailers. Amazing architectural covers for stages, vehicles, meet and greets..
Big event looks for a small event budget. Make your event stand out from the crowd. A stunning centrepiece to any event. Draws people in like a magnet. Visually and acoustically the Saddlespan satisfies audiences again and again.